I nodded � understanding what was bugging her, although we all know death is not something we can control. It is almost as if your child is the starting point of you, and you represent the end point. And the time between your child's birth and your own departure is the blessed time you spend together. Multiply the number of children by three, and you have three reminders of your mortality and awesome responsibility. Add the one more variable � that the firstborn is autistic � and you can imagine what keeps parents like us awake at night. And suddenly, the wife's comment did not seem so ludicrous anymore. A few months ago, I went to see a specialist about sleep apnea, or more specifically, Obstructive Sleep Apnea Syndrome, a problem that has been plaguing me for years. Because of upper airway obstruction, I was having difficulties getting a good night's sleep and one of the symptoms is very loud snoring. My snoring was so bad, I remember one reservist stint, the guys made me sleep outside the tonner, because "mr brown International Airport" was making too much noise. You can imagine what my wife goes through. It is also very dangerous for your health, because sleep apnea can lead to heart attacks and strokes. The doctor was blunt and candid. There were surgical procedures that could be done to reduce blockage but there was also another cause. I was way overweight. My body mass index was above 30, which was not good at all. I was weighing in at 90kg, which is a far cry from the svelte figure I had when I got married nine years ago. No amount of baggy pants, loose T-shirts and vertical stripes could hide the whale I had become anymore. And since part of the snoring and blockage was linked to being fat (no point being polite about this because I was), the doc suggested I try losing weight first. I was given a mild appetite suppressant to help kick-start the drastic change in my lifestyle, but the bottom line was that my diet had to change and I had to exercise. There were no shortcuts or fads, no magic pill. Several things had to go. No more daily teh peng (iced milk tea loaded with lovely condensed milk), no more soft drinks, and no more sweet drinks. The sugar in those drinks and other stuff such as desserts and sweets was one of the major contributors to the weight gain. You can imagine the withdrawal I went through. The first week was rough. When your body has been used to all that sugar, taking it away is very, very unpleasant. But slowly, the body adjusted and, after a while, it got used to life without excessive sugar. The second thing to do was to reduce my food portions. I was simply consuming more than I needed. I was the kind of guy who would order the $3 bowl of noodles if the hawker sold the basic bowl for $2, and after upsizing my bak chor mee, I would almost always order a side dish, like say, chai tow kuay. I proceeded to eat about half of what I used to eat, increasing the veggies � which I used to hate � and cutting down the rice, noodles and the deep fried stuff. And to aim for being around 80 per cent full, rather than 120 per cent. You don't realise this until you start on a healthier diet, but Singapore food � while extremely delicious � is also mostly very bad for you. I ended up walking around the hawker centre eliminating my choices. Laksa, nope. Char kuay teow, nope. Nasi lemak, nope. It was very frustrating. 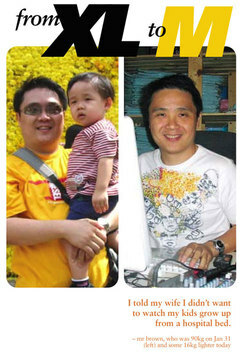 In the first month alone, just by overhauling my diet, I lost about 5kg. No crash diets, no special drinks (I saw one diet plan advertised that claimed to let you carry on BINGEING while maintaining your weight), no electric shock belt. The third thing to do was the hardest. Exercise. The doctor suggested I try climbing stairs as a start, every day when I went home from work. Look, I live on a high floor. I work late, usually coming back at midnight brain-dead. And I had to climb my way home. Right in front of my newly-installed lift. But climb I did, and I started doing other things too, like swim and go for brisk walks. The wife was most pleased with the determination. She had been nagging me for the longest time to do something about the weight. I told her I did not want to watch my kids grow up from a hospital bed. It's been about four months since I started. I am not at my target weight yet, but let's just say I have had to buy new clothes because all the old ones do not fit anymore. I look like a clown in my size 36 to 38 pants now, and I am now around size 32. My tees are now size M, not XL or L.
My wife no longer makes me sleep in the living room too because the snoring has gone down, and I no longer fall asleep at my desk. And the best thing about all this is: I can now play up with my three kids without losing steam within 10 minutes. mr brown is the accidental author of a popular website that has been documenting the dysfunctional side of Singapore life since 1997. And no, he will not pose for slimming ads.